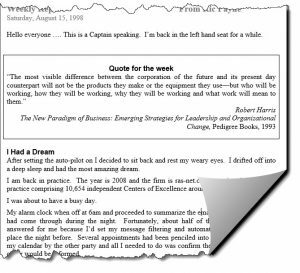 In 1998 I was the CEO of Results Accountants’ Systems – the Accountants’ Bootcamp company. During a particularly difficult time I wrote a weekly report to our 100+ team scattered around the world. 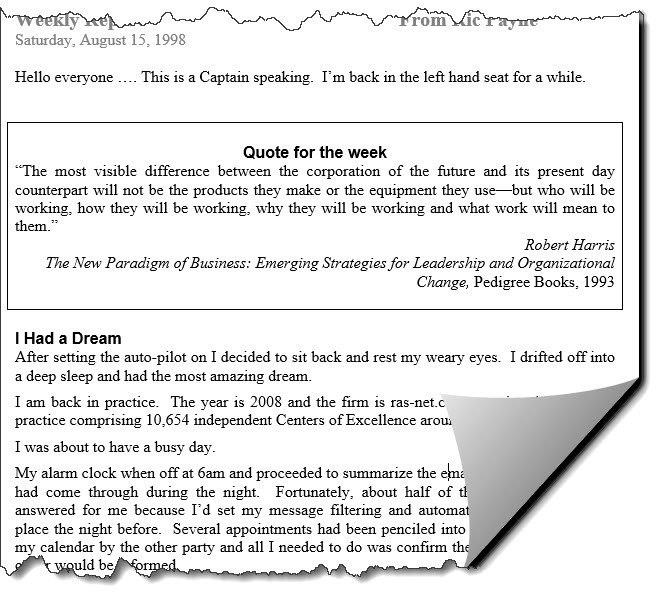 The report I wrote on August 15 talked to a “dream” I had about the way firms would be operating in the future. I picked 2008 as the year that defined the future but was out by 10 years. I thought I’d re-publish the report, if for no other reason, to reflect on how many of the things I talked about have become a reality and to make the point that the things I talked about, and which were starting to take shape in 1998, are just the beginning. Technology has now really got traction and I’m certain the next 20 years are going to be mind-blowing. I’m looking forward to being around long enough to see it. For example, the report pointed to the use of artificial intelligence (I called it an Intelligent Business Information System,) calendar sharing, cryptocurrency, voice recognition, global client reach, video conferencing, crowd sourcing knowledge, cloud accounting, robo currency management, network collaboration and fee sharing, virtual practice structure, and the humanization of tasks that computers can’t do. Should Governments step in to assist businesses in trouble? Ever thought of playing a game with your clients?